The most badly designed page in the world? 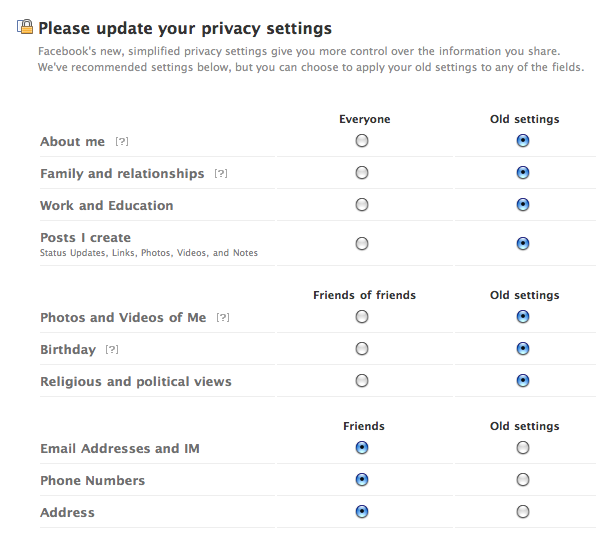 This is Facebook’s “transition” page for the new privacy settings they’re currently rolling out. I can’t for the life of me make heads or tail of it. I nominate it as the most badly designed web page in the history of usability, user experience and information architecture. Why can I switch some things to “everyone”, some things to “friends of friends” and some things to “friends”? What if I want photos to be available to everyone or just my friends? Although I agree it was pretty terrible. There was a hover-over on the ‘old settings’ radio button that told you what the old setting was. Obviously not very discoverable then! Hmmm… but why would I hover over a radio button that’s already selected?